Cybercriminals are known to take advantage of everything that's popular among people in order to spread malware, and Google's official Play Store has always proved no less than an excellent place for hackers to get their job done. Dubbed Update WhatsApp Messenger, came from an app developer who pretended to be the actual WhatsApp service with the developer title "WhatsApp Inc."—the same title the actual WhatsApp messenger uses on Google Play. "I've also installed the app and decompiled it," one Redditor said. 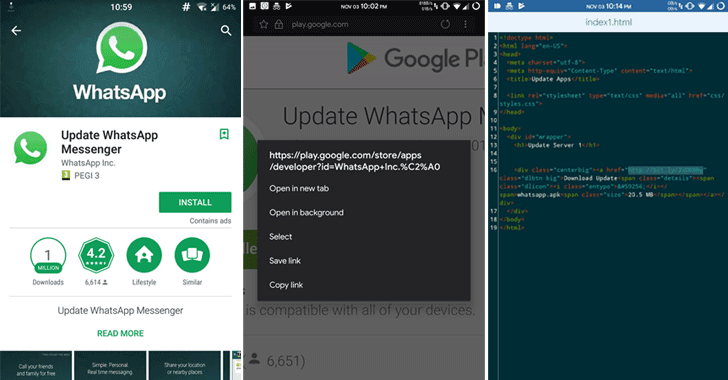 "The app itself has minimal permissions (internet access) but it's basically an ad-loaded wrapper which has some code to download a second apk, also called 'whatsapp.apk.' The app also tries to hide by not having a title and having a blank icon." Google has now removed the fake WhatsApp Android app from its official Play Store, but this incident once again marked the tech giant's failure to spot the scam on its app platform—even for the program that had more than a million downloads. It is an unfortunate truth that even after so many efforts by Google (even recently launched Bug Bounty Program), malicious apps continuously somehow managed to fool its Play Store's security mechanism and infect millions of Android users.